Our pump stations for boosting applications come with a check valve in the discharge that assures that the water column or an eventual water hammer will not affect the pumps. Also avoid the water recirculation between both pumps. Note: the suction lift information will have to be provided in PSI by contractor or must come indicated in the project specification. Our pump stations for lifting applications come with a check valve in the suction of every pump that assures that the pumps will never lose the prime during the operation. Also to avoid the water recirculation between both pumps. ADVISORY: in lifting applications it is always important to put a foot check valve in the very bottom of the suction line, in this way the pump station will never lose the prime. 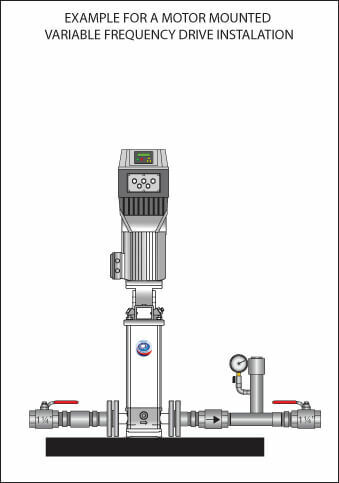 In order to make the selection of the pump station the flow is a mandatory parameter. The flow required depends on the system needs and it is information that normally is provided by the contractor or it is indicated in the project specifications. PD WATER SYSTEMS designs pump stations that deliver the flow requested at the exit of the discharge manifold. It is always important to make sure that the water source will be able to provide the maximum flow required in the project specifications. A flow below of the requirement will end in a malfunction of the pump station, pump cavitation or running dry situation. For our selection program, the FLOW, must be given in GPM (Gallons per minute). 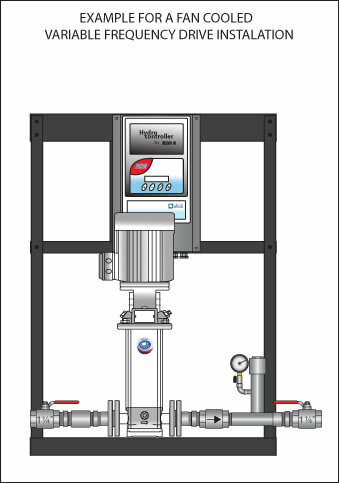 Every System has different pressure requirements for the correct operation. 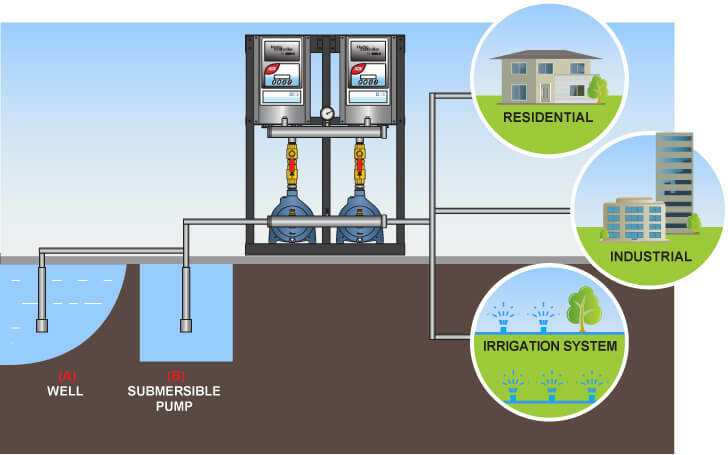 PD WATER SYSTEMS develop pump stations for delivery constant pressure by using the most advanced Variable Speed Drives. 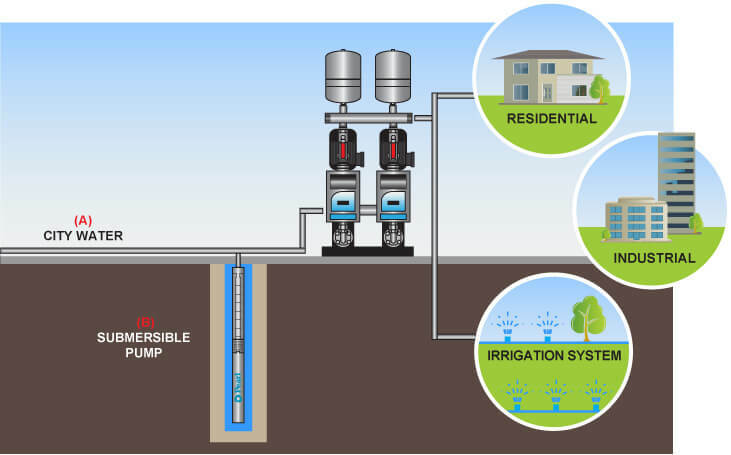 The PRESSURE is intended as the Pressure that the pump station must deliver to satisfy the system needs (building, irrigation system, etc….). This parameter is usually provided by the contractor or comes in the specifications of the project. It is important to make clear that our systems will deliver the requested pressure at the manifold exit, considering the suction lift equal to zero (0) or at the same level of the inlet of the pump. If the pump station will be lifting from a source below the inlet of the pump, then suction lift will have to be taken into consideration in the calculations of the pressure required. Note: Do not forget that the suction pipe will have to be correctly sized, and eventual pressure losses will need to be added to the pressure required by the project specifications. For our selection program, the PRESSURE, must be given in psi. The Variable Frequency Drives (VFD) are electronic devices designed to keep the pressure of the system by modifying the speed of the pump motors. PD WATER SYSTEMS brings to the market the most advanced VFD’s to provide to our distributors the best option for the application. The uses of VFDs also bring important energy saving, because the motor will be working at the minimum speed needed to guarantee the pressure and flow requested. 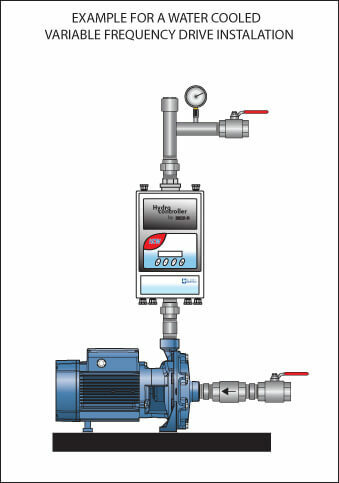 These types of VFDs work assembled on the discharge line and allow the water to flow through it cooling down the device. This type of VFDs, do not use an external pressure sensor and the weather resistance construction type allow them to work outdoor. Our VFDs Water Cooled can work as a single unit or in multiple pump systems. These types of VFDs work as a wall control panel and the cool down of the device is done with a fan assembled in the back of the unit. This type of VFDs, uses external pressure sensor and their installation is only intended for indoor installations. Our VFDs Fan Cooled can work as a single unit or in multiple pump systems. These types of VFDs work assembled on top of the motor of the vertical pumps and the cool down of the device is done by the pump motor fan.. This type of VFDs, uses external pressure sensor and their installation is only intended for indoor installations. The selection of the pump that will be assembled to the pump station is very important, since depending on the application, environment, water source, the temperature and the lifting conditions, it will be recommended a type of pump or another. Recommended when there is no need of a Stainless Steel pump. 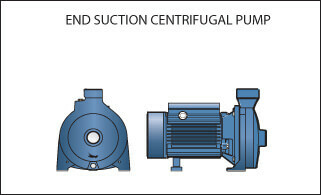 The End Suction Centrifugal Pumps behave very well both, in boosting and in lifting applications. This type of pumps can work in applications with water table up to 12 feet depth. PD WATER SYSTEM made a selection of multistage self priming pumps, which deliver outstanding performances by having self priming capabilities. 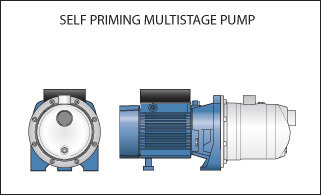 These types of pumps are recommended when the pump is boosting the pressure or lifting. This type of pumps can work in applications with water table up to 18 feet depth. 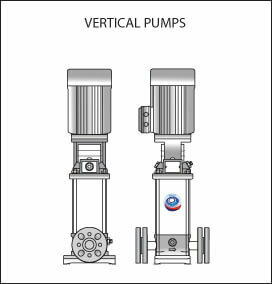 •	When space is an issue, vertical pumps become very useful since the pump stations assembled with this type of pumps are very compact. The Vertical Pumps find application in any kind of boosting application and also when work in lifting conditions from a source such a storage tank or lake. This type of pumps can work in applications with water table up to 8 feet depth. PD WATER SYSTEMS in its commitment to provide to our customers the highest quality standard of products has developed a list of options that guarantee the perfect product for the application required. In our list of pump stations it is possible to find manifolds assembled with components 100% STAINLESS STEEL or with Stainless Steel and brass. We have available systems with all the components in STAINLESS STEEL that are recommended in purification system, potable water or any application where it is required such type of materials. Our pump stations are available with components that combine STAINLESS STEEL and LOW LEAD BRASS components. This type of manifolds are assembled with a EUROPEAN STYLE of valves that reduces the dimensions of the pump station and also bring some saving to the total cost of the pump station.